Back in "Let's stop flushing forests down the toilet WEEK", we learned that the paper industry is one of the biggest contributors to global climate change and environmental degradation in general. The problems are (at least) three-fold: First, virgin forests that help absorb Co2 and that support complex, biodiverse ecoystems are ravaged. Once that biodiversity is gone, it's lost forever--we can't just create a simulated perfectly balanced ecoystem by planting new trees. Secondly, the pulp-making process is highly polluting--releasing greenhouse gases, and poisoning water and air. According to the NRDC, in many countries the paper/pulp industry is both the biggest consumer AND polluter of water. Third, of course, is the problem of what happens to our disposable paper products after their short lives of usefulness to us. Again, according the NRDC, "Americans use an average of 741 pounds of paper, per person, each year." Most of that ends up as trash in our ever-expanding land-fills. We can't keep putting our rubbish in holes in the ground forever. (Funny, I wonder what the ratio of landfills is to in-tact forests these days. Has our refuse for unwanted, single-use items already surpassed the resources that gave birth to these disposables?) The ridiculous thing is, we can get so much more usage out of our paper products. You guys probably do a lot of this stuff already, but here are a few basic tips for reducing, reusing, and recycling our copy and writing paper at home and at work. One of the gifts of the electronic age is that we can communicate, create, and stay on schedule without ever having to make hard copies. Take a second to think before you pull the trigger and print only what you really need! Too many times I've printed out a whole page for one small piece of information, like an address. If you mapquest something, write down the directions in your planner or on the back of an already used piece of paper. On a related note, did you know you can refill your printer cartridges for half the price of buying a new one? Visit Cartridge World (thanks, Green LA Girl) instead of throwing that cartridge away. They have Pasadena and Westside locations...if you're not in LA, they might have one near you because there are 400 locations nationwide. Yipee for saving money and not creating more plastic trash! This is a real revolutionary one! Instantly cut your paper usage in half by using BOTH SIDES of a piece of paper! That goes for notebooks and loose paper. At work, write on both sides of that legal pad. Fill your printer with paper that has only been printed on one side. Many businesses are designating a drawer in the copier and printer for this purpose. If you ever need to print something "official", just put in a blank piece on top. Also, make a stack of half-used paper that has been folded or is otherwise unsuitable to go through the printer, and use that as a writing pad. For years I've kept such a stack on a clipboard to use whenever I need scratch paper around the house. These stacks last so long, that I never have to buy pads of paper to use at home. 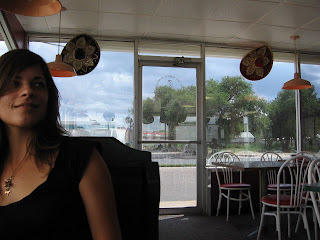 It's also a fun jaunt down memory lane to flip through the used side--old college papers mixed with bank statements and drafts of cover letters for jobs I never got. I've also taken to saving envelopes in the same way, because I always end up writing on them anyway, so i might as well gather them on a clipboard. When you do have to buy paper, buy 100% recycled with the highest post-consumer content you can find. 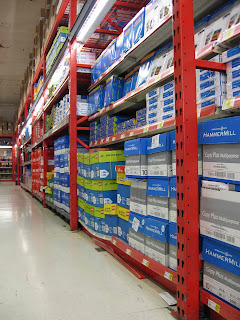 I just paid Staples a visit and they have quite a variety of recycled paper in practically every form you can imagine. 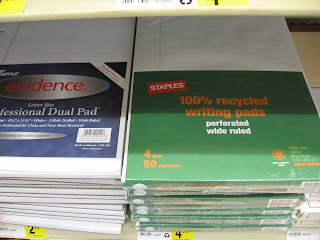 Reams, spiral notebooks, legal pads, file folders, envelopes, post-its (although the latter is suspect because nowhere on the package does it say what percentage is recycled--the better option would be to just stay away from post-its altogether and use pre-existing scratch paper, see above). From what I saw, the recycled stuff is a tad bit more expensive than the generic Staples brand, but pretty equivalent to other brands. And, since you'll be reducing your paper usage via steps 1 and 2, it will surely even out over the long term. Also, try to get unbleached paper when possible. Since working in a production office has to be in the running for "how to waste the most paper", I've gotten our producer to agree to recycled. Also, we ran a survey about our distribution lists...are you reading what you get or just throwing it away? If you don't need it on hard copy, take yourself OFF the list! !